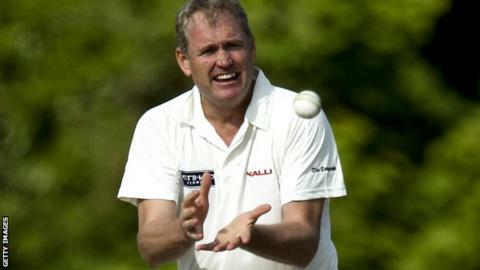 Former Australia all-rounder Tom Moody has ruled himself out as a contender for the England coaching job. The ex-Sri Lanka coach, 48, was thought to be among the favourites to succeed Andy Flower, who resigned in January after the 5-0 Ashes loss in Australia. Moody coaches Sunrisers Hyderabad in the Indian Premier League, and also works as a television commentator. "I haven't applied for the job so I won't be among those being interviewed," he said. "At this stage I am not interested in the position considering what I currently have on my plate." The England and Wales Cricket Board (ECB) wants to revert to a single coach for England's Test, one-day international and Twenty20 sides, having split the job in 2012. Moody believes the ECB board favours appointing an English coach, putting the national team's limited-overs coach Ashley Giles, Lancashire boss Peter Moores and Nottinghamshire director of cricket Mick Newell at the head of the running. Giles, 41, oversaw England's early exit from the recent World Twenty20, while 51-year-old Moores led the national team from 2007 to 2009 until he was sacked following a rift with then-captain Kevin Pietersen. Newell, 49, has no international experience, which Moody believes could hinder his chances. "I've got a lot of respect for Peter Moores," added the former Worcestershire player and director of cricket, who was speaking on BBC Radio 5 live's Sportsweek programme. "He has done a terrific job wherever he has gone. Because of very unfortunate circumstances, his international career was cut short. "I'm sure, if given the opportunity, he would do an excellent job." On Giles, he said: "I wouldn't be looking at the results. You also need to look at what he has got to work with." Moody, who made 84 appearances for Australia, was Sri Lanka coach from 2005 to 2007, guiding them to the World Cup final, before returning home to coach Western Australia. Who should be England's next head coach?